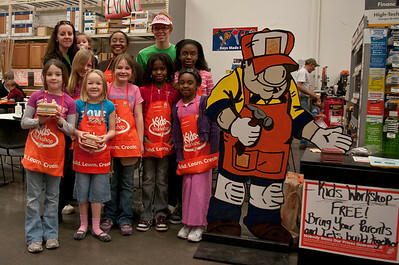 Today we went to Home Depot with Olivia's scout troop for a fun day of making wood trinket boxes. I did bring along my camera to photograph some memories. It was a fun time, but I did not make a single fantastic photo. The one above is probably my favorite. Mia was very excited to get her own apron, complete with her name as well as a pin and the opportunity to make something cool. The woman in the background of this photo was very kind even though Mia played shy and did not really say a word to her. Olivia's scout troop seemed to really enjoy themselves and allowed me to photograph all of them at the very end.